It has been 11 months and two emails later and to date the king of fair and balanced has not responded or commented on this report. I think it speaks to Mr. O'Reilly's credibility. What follows is an email I sent to Mr. O'Reilly's FOX Network address in February of 2013. Since Mr. O'Reilly is the self professed king of "fair and balanced" reporting I thought he would be happy to clear up what appears to be puffery in his book Killing Kennedy. It hasn't happened so here is the email for your review. I asked Mr. O'Reilly to show me where I am wrong. "In March of 1977 a young television reporter at WFAA in Dallas began looking into the Kennedy assassination. As part of his reporting, he sought an interview with the shadowy Russian college professor who had befriended the Oswald’s upon their arrival in Dallas in 1962. The reporter traced George de Mohrenschildt to Palm Beach, Florida, and traveled there to confront him." "As the reporter knocked on the door of de Mohrenschildt’s daughter's home, he heard the shotgun blast that marked the suicide of the Russian, assuring that his relationship with Lee Harvey Oswald would never be fully understood." "By the way, that reporter’s name is Bill O'Reilly." I have been investigating various aspects of the Kennedy assassination for over 35 years and have seen many problematic “first hand” claims. Mr. O’Reilly’s assertion that he “heard the shotgun blast” seems questionable and is possibly an embellishment. Therefore, I decided to look further into his claim. To fact check, I will use the following documents: 1] the Palm Beach County sheriff’s investigative report case # 77-11753. 2] Quotations from the book The Last Investigation written by Mr. O’Reilly’s friend Gaeton Fonzi. 3] Source information found in Edward Epstein’s book The Assassination Chronicles. Epstein, Edward Jay. The Assassination Chronicles (New York: Carroll & Graf, 1992), p. 559. “George de Mohrenschildt arrived in West Palm Beach, Florida, in the evening, from New York City, after having returned from a business trip to Belgium. He began preparing for an upcoming interview with author Edward Epstein. Epstein was staying at the Breakers, One South County Road, Palm Beach, Florida. George de Mohrenschildt met with Epstein briefly in Palm Beach. Mr. Epstein was writing an article about the Kennedy assassination for Reader’s Digest. de Mohrenschildt was to receive $4,000.00 for his input. Epstein also provided de Mohrenschildt with a rental vehicle. George de Mohrenschildt leaves the Breakers for lunch at the home of Nancy Tilton. He promised Epstein to return later that day around 3 p.m. to continue the interview. "As the reporter knocked on the door of de Mohrenschildt's daughter's home, he heard the shotgun blast that marked the suicide of the Russian, assuring that his relationship with Lee Harvey Oswald would never be fully understood." "By the way, that reporter’s name is Bill O'Reilly." Fonzi, Gaeton. The Last Investigation (New York: Thunder’s Mouth Press, 1993), p. 192. The scenario described by Mr. O’Reilly should raise a few eyebrows. Based upon his book and police report we can deduce the following. He claims to have arrived on the front porch of Nancy Tilton’s home** just before 2:21 p.m. He knocks on the door and hears a gunshot. Strangely, based on police interviews, no one inside or outside the house heard the gun shot. Thirty five years later, Mr. O’Reilly claims to have been on the front porch and heard the shot. There is no evidence in witness statements or the police report that Mr. O’Reilly or anyone else checked around the house to seek assistance. No one contacted the police about hearing a gunshot coming from inside a private residence. It wasn’t until 14 minutes later that the body was discovered by de Mohrenschildt’s daughter. For the above reasons, I question Mr. O’Reilly being there. There are two other problems with Mr. O’Reilly’s scenario. 1] I couldn’t understand why three of Tilton’s staff both inside and outside the house, some closer to the scene than Mr. O’Reilly, didn’t hear the shot. The answer lies in how Mr. de Mohrenschildt committed suicide. He was on the second floor. He “placed the barrel (of a 20 gauge shotgun) in his mouth and discharged the weapon at an upward angle through the roof of his mouth and into his brain.” Brain matter and the brain case have a tendency to muffle the sound. Apparently, the shot was muffled to everyone but Mr. O’Reilly. 2] One would think a reporter sent by a television station over 1,200 miles for the express purpose of interviewing Mr. de Mohrenschildt would stay to see what unfolded. Instead, he simply just walked away? I know it is impossible to prove a negative, but in my opinion, solely based on the research I have done, I seriously have questions as to whether Mr. O’Reilly was there to begin with. Mr. O’Reilly - show me where I am wrong. **He incorrectly states that Alexandria de Mohrenschildt owned the property. 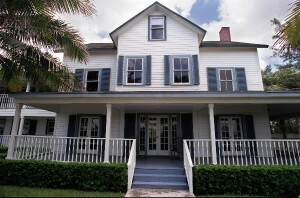 Originally the “mansion” was located at 1780 South Ocean Boulevard, Manalapan, Florida. Manalapan is located between Palm Beach and Ocean Ridge. The house was left to Tilton by her grandparents Leila and A. Romeyn Pierson. Developers purchased theproperty in 2000 for 4.4 million dollars and razed the building.